Neighbours who complain about construction noise at unsociable hours are being hit with trespass notices as some disputes sparked by Auckland’s building boom turn nasty. Some neighbours have also laid police complaints about “abusive” responses from construction workers when they complained about the noise. 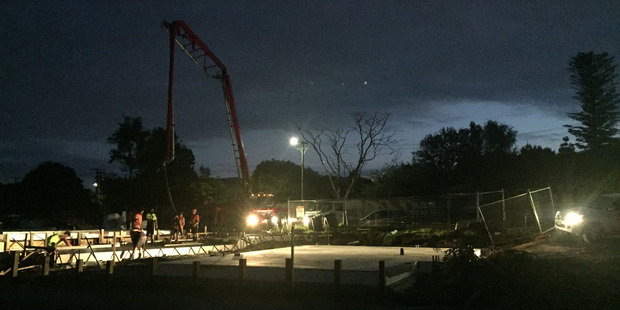 The Herald has been inundated with feedback from all over Auckland and beyond after reporting that young families near a Mt Albert construction site were woken by a noisy concrete pour at 5.30am on Wednesday. Howick resident Tanya Newman, who is recovering from breast cancer, said she and her husband complained to Auckland Council five times about work starting before 7.30am and continuing until 9.30pm or 10pm on three townhouses next door in Gibraltar St. The developer’s response was a trespass order. “He issued us with a trespass notice. Us and the neighbours got them and we were just going, ‘What the hell! '” she said. [the developers] just do it again, so really it’s pointless. Ian Smallburn, General Manager Resource Consents at Auckland Council said issues around construction noise are taken very seriously every incident is investigated. A graduated enforcement approach is taken with resource consent holders. “While there is a need to build houses quickly, we also need to consider neighbours and how construction noise will affect them, which is why generally, construction cannot begin until 7.30am, and must be finished by 6pm,” he said. Resource consent for the Gibraltar Street, Howick, development allowed the property to be subdivided and three town house built. The resource consent restricts noisy construction activity on the site to between 7.30am-6.00pm Monday to Saturday. “We have received two noise complaints regarding this development and have contacted the consent holder to remind them of their obligation to comply with the consented hours of construction,” he said. Hobsonville resident Peter Terstappen said he was also threatened with a trespass order after he complained about a worker operating a digger on a building site at 10pm. “The only response was, ‘I couldn’t do it any earlier and I have to do my work and that’s it’. Auckland Council spokesperson Ian Smallburn again said complaints had been received advising council of construction work outside of the permitted hours. “We have received noise complaints regarding this development and have been in contact with both the customer and the project manager for the site to discuss the issues raised,” Smallburn said. A Swanson resident who did not want to be named said her husband laid a police complaint after being abused by a digger operator at 6.30am. “It was pretty serious verbal abuse, language that I would curl up and die at,” she said. But the couple have not been informed of any action being taken. They estimate that they have complained to the council about building work outside the permitted hours 300 times since they bought their house last April next to a large subdivision between Christian Rd and O’Neills Rd. “We knew it was going to happen. We have never had an issue within the [permitted] hours,” she said. “But we’ve had trucks and diggers being unloaded at 6am on weekdays and weekends, including multiple, multiple Sundays and public holidays. “Our stress level has just rocketed. We get up in the morning, the first thing we do is come outside and see who’s working today, and every day starts with half an hour on hold [calling the council]. A Glen Innes resident, who also declined to be named, said she and her husband had made “dozens of noise complaints regarding trucks on the street with engines running before 6am, earthworks and diggers starting well before 7am, and last week a digger started work at 8.50pm”. “We are young families so it makes for a pretty tough time trying to get babies and kids to sleep, plus living in a house shaking with earthworks all the time,” she said. Tamaki Regeneration housing general manager Neil Porteous, whose company is managing the Glen Innes work, said he was “committed to working with the local community in addressing issues as soon as they arise”. “We will be contacting all contractors today to reinforce the need to adhere to their consent conditions and to reiterate the importance of respecting that they are working in residential areas,” he said. Auckland Council resource consents general manager Ian Smallburn said the council took construction noise very seriously and investigated every incident, “taking a graduated enforcement approach”. He said the council received two noise complaints about the Gibraltar St townhouses and “contacted the consent holder to remind them of their obligation to comply with the consented hours of construction”. At Hobsonville, he said council staff “have been in contact with both the customer and the project manager for the site to discuss the issues raised and we are currently considering the most appropriate enforcement action to take”.